Proposition 37, a Mandatory Labeling of Genetically Engineered Food Initiative, is on the November 6, 2012 ballot in California. The EcoEtsy team is in favor of GMO labeling and we hope you will support this initiative. Before I tell you why, do you know what GMOs are? GMO stands for Genetically Modified Organism, and GE stands for Genetically Engineered. This is not the same as hybrid creation by normal cross breeding means. GMOs are created in a lab by combining DNA from completely different organism. For example, BT corn is corn that has been created with the addition of a bacterial gene which encodes for the Bacillus thuringiensis toxin. This toxin is then made in every cell of the corn. GMO foods have been on the market in the US for the last 20 years. Some of the most common GMO foods include corn, soy, safflower, Canola, Hawaiian Papaya, sugar beet, Aspartamate, milk from rBGH treated cows, yellow crookneck squash, and zucchini. 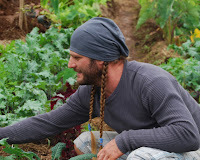 1) We have a right to know what is in our foods, so we have the freedom to choose what to eat and what kind of agriculture practices we support. Without labeling we don’t know what is in our food, though it is estimated that 80% of processed foods contain GMO. 2) The US falls short in best accepted policies for GMO labeling. 50 countries now label genetically engineered foods including Australia, Japan, Mexico, Russia, the European Union and China. 3) Serious health issues are linked with GMOs in humans and animals including: cancer, infertility, allergies, and irritable bowels. We do not have assurance of safety. The Food and Drug Administration does not test GMOs despite warnings from it’s own scientists. GMO manufacturers suppress independent safety testing with patenting of seeds. 4) Herbicides and Pesticides used in GMO farming are highly dangerous to farmers health. 5) GMO farming increases use of toxic herbicides creating superweeds. These superweeds lead to more pesticide use. 6) GMOs contaminate the natural and Organic seed supply through pollination between GMO and Non-GMO crops. 7) GMOs do not improve crop yields. This is particularly important in the context of climate change and drought. 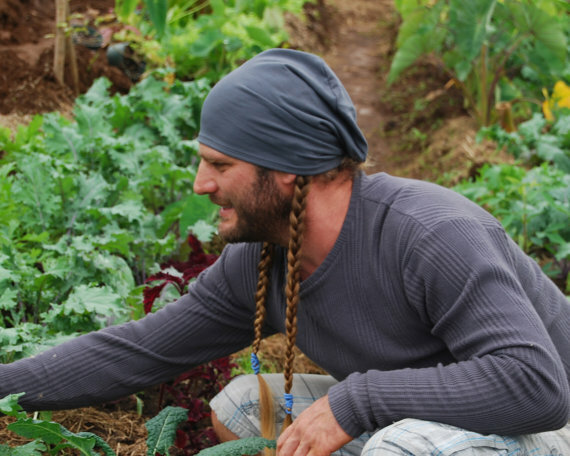 Organic crops have shown to consistently produce better under drought conditions. 8) GMOs are dangerous to the livelihood of farmers. Unlike traditional crops farmers are not allowed to save seed to replant for future sowing. Farmers face expensive court battles, including Monsanto versus Vernon Hugh Bowman whose case will be heard in the Supreme Court. 9) GMOs promote seed slavery. A seed is not an invention. That is why patents on seeds are illegitimate. Even in a genetically engineered crop, the original seed come from farmers. Patents on seed are based on biopiracy… Patents on seed allow corporations to prevent farmers from saving and exchanging seed. Thus patent violates farmers’ right to save, use, reuse, breed and exchange seed as their commons. 10) Labeling will offer more options for the consumer at no extra cost, because they will have the opportunity to vote with their dollars. 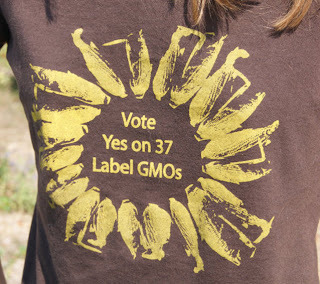 Opponents of Prop 37 suggest that labeling GMOs will result in increased food prices. However there is no evidence that food prices have increased in the many countries that have implemented GMO labeling. "As a consumer it is very important to me to know WHAT is in everything I eat and feed my family. I have read studies with US government data showing GE crops have produced an overall increase, not decrease, in pesticide use compared to conventional crops. I am working hard in my life to limit my families exposure to pesticides and chemicals and anything that requires the use of more known carcinogens is not ok in my opinion. From what I have learned there has been very little long term testing on the effects of GMOs on the human body which is another huge reason why I do not trust them. As a farming family, we do not support GMO seeds, because plants grown from them will not produce their own seeds which makes the farmer a slave to the GMO seed companies. There are many more reasons why we want to see all products using GMOs to be labeled accordingly." Californians, will you vote yes next month to label GMOs? Everyone else, will you ask you friends in Califonia to vote yes on prop 37? You can also volunteer by making phone calls. Spread the word and feel free to repost this top 10 list to your blog or website. aquarianbath – has written 3 awesome posts on Eco Etsy. Cory is the owner of AquarianBath.com She is an Etsy Bath and Body product seller, soap maker, community herbalist, organic gardener, and homeschooling mom. Her background is in Traditional Chinese Medicine and Biology. Cory and her family live in Daytona Beach, which is USDA growing zone 9a. Follow her blog for more articles. Thank you so much for reposting this Diane. I really appreciate it!